After the sleepless night I was really weary, and dreading the hill out of Lahinch. As we settled our accounts at the desk, the same young man who had been on duty late last night was still at the desk, looking fresh in semi-formal attire. I said to him that he seemed to be working long hours, and he agreed, saying that some of the help was out on that day. Furthermore, he was also responsible for the sister hotel next door. I was really impressed with his friendliness and appearance of competence. Len was telling me that when he had corresponded with this hotel on the Internet for reservations that he hadn’t heard back confirming his request for several weeks. When he had finally heard from them, they had apologized for the delay, saying that there had been a death on the staff. Now Len asked the young man about this, and we were told that this had been his father, who had run both of these hotels. His father had been relatively young and strong, but had suddenly succumbed to cancer. Now the young man had taken over the hotels. It was a very sad story, and his voice trembled as he told us this. 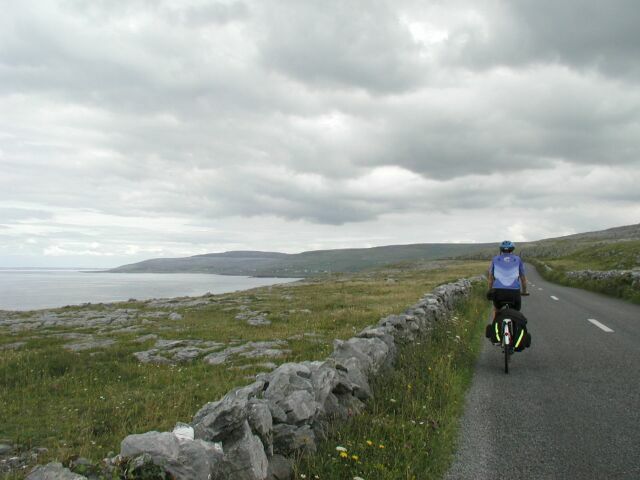 In a saddened and weary mood I started to bike north along the coast out of Lahinch. The day was once again overcast after the sunny day that had gone before. The first four miles were easy along the coast, but then the road turned northeast to climb the hill to the famous Cliffs of Moher. Soon I was gasping, and then resting, and then pedaling. The view down to my right grew more and more panoramic. I was dripping with sweat in my rain gear. I could feel the drops fall on my face as if it were raining. Up ahead I could see Len finally pulling into the visitor’s center parking lot, while I still watched the elevation reading on my GPS moving up and up. Round and round went my feet, and for each several revolutions the elevation would gain another foot or two. As the reading passed 750 feet, I pulled into the parking lot, thankful, wet, and gasping. I did feel some small sense of accomplishment at having made it, but I was too weary at the time to appreciate it much. 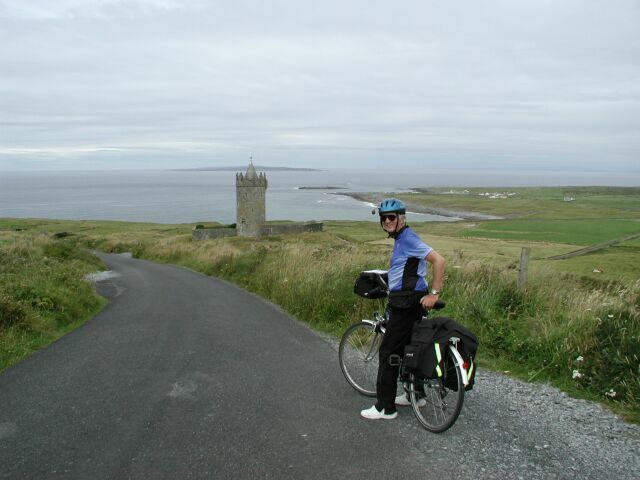 A week later, when I was back in New Jersey, I got out a book on cycling in Ireland and looked up the description of the bike route that went past the cliffs of Moher. The book rated climbs as from one to three asterisks – one being flat with no real hills, and three being quite hilly. This particular route was rated a “one” – flat with no real hills. Any small sense of accomplishment that I had acquired quickly dissipated. How humiliating! But you don’t suppose they made a mistake, do you? I mean look at those cliffs, and realize that there must be a hill around there somewhere if you’re coming up from sea level. 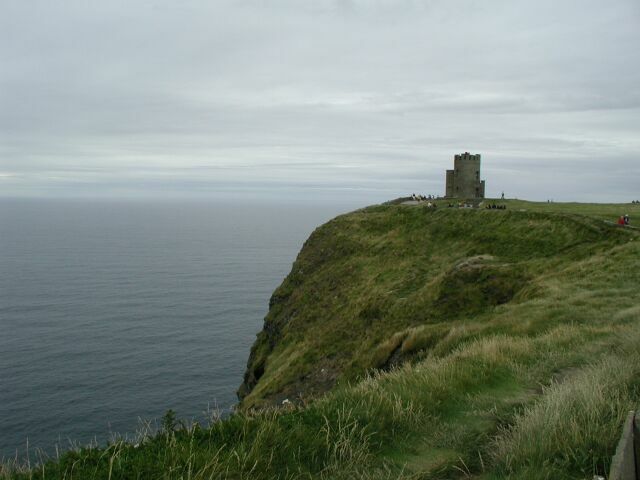 We had coffee at the snack bar, and then began the walk along the cliffs up towards the north, where there was an ancient tower. Along the walk there were several enterprising musicians playing Irish music for tips. A young woman playing an ancient harp or zither was actually quite good, but we didn’t tarry. When we got to the tower there was an admission fee, and I balked, while Len went ahead up the steps of the tower. I’m not sure whether I was too cheap to pay the fee or too tired to climb the steps, but I admired the view while Len ascended to the slightly higher view from the top of the tower. Later he said that it wasn’t worth it, but I’ll never really know. 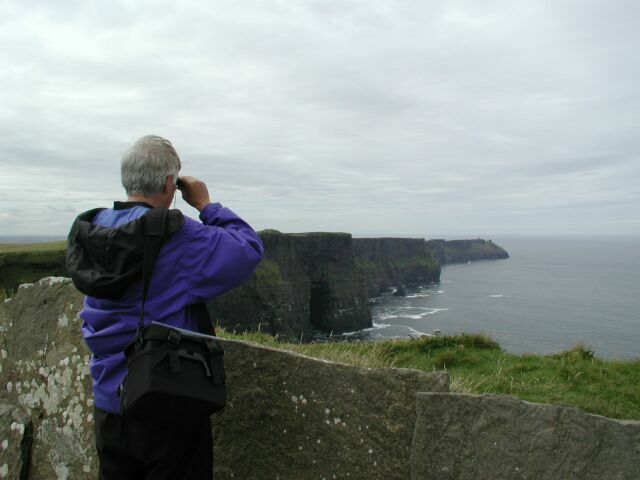 We paused to admire the cliffs with Len’s hand binoculars. 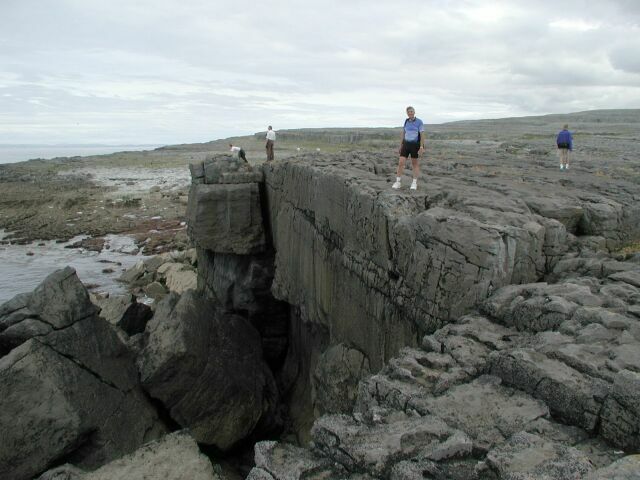 They gave the cliffs a 3-dimensional aspect that seemed to have been lacking from the distant, unaided perspective. I could see the many birds soaring near the cliff face on the updrafts of air that must have been present. 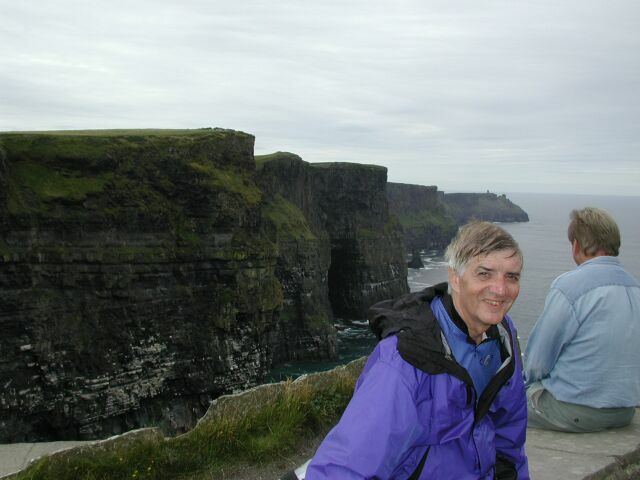 In the binoculars the cliffs seemed alive with foaming surf, cave-like entrances, and the large variety of birds. It was quite a sight, but it was also time to be on our way. The good news was that we were nearly as high in elevation that we could get, so we would be able to coast for a while. After a couple of miles we turned down towards the coast below us, and went down a steep hill past an old castle. The run down past the castle was steeper than any stretch of road on the trip, and all I could think was how glad I was that I wasn’t coming the other way. At the same time I was once again regretful at losing the elevation, knowing that somewhere soon I would be facing another uphill climb. At the bottom of the hill past the castle we came to the little town of Doolin, famous as a center of traditional Irish music. Given the writeups in the tour guides, I expected a bigger town, but Doolin barely qualified as having even a single main street. Nevertheless, it was quite an active place. There were several tour buses, many hikers, and quite a few other bikers. We locked our bikes outside a souvenir store, and went next door to a small food market. As usual, it was a puzzle finding something that could serve as lunch, but we bought a few snacks and enjoyed them at an outdoor table while we watched all the activity around this tiny place. I watched some young German cyclists head out of town to the south up that steep hill past the castle. They seemed to be going pretty fast, and I felt envious of their youth and freedom, but at the same time happy that I at least had gotten there on my own power. Len spoke to the driver of a van that was serving as a sag wagon for a tour of cyclists. The van carried their luggage, and the driver acted as a kind of tour guide for a group of young cyclists headed our own direction. I thought that was kind of cheating, and an hour or so later we were passed by the same van. We were quite amused to see the cyclists sitting in the van with their bikes racked up on top. Apparently they had given up for the day. Wimps! This was the first time we had really encountered hikers. Doolin is a center for hiking the Burren Way, a marked path through the interesting and unusual part of the country that we were about to enter. I had read about the Burren, but had little understanding of what it was. I was about to find out, and what I found was – rocks, rocks, and more rocks. 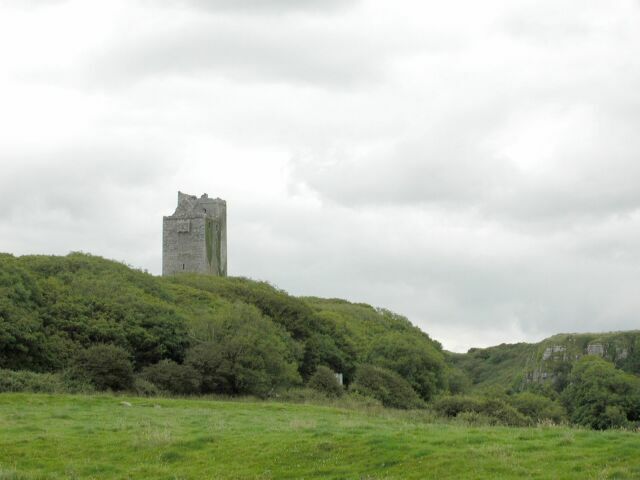 But first, leaving Doolin we had to climb a moderate hill (250 feet vertical), inland past another ruined castle. After this the road turned back to the coast for the last time. The rest of the trip from here around Galway Bay was to be all along the coast, and the hills would be comparatively gentle. It was still about seven miles north along the coast to Black Head, where we would turn eastward along Galway Bay. This part of the trip was along a rocky coast on our left, flanked on our right by rock-strewn hills. There were very few buildings or homes. Mostly just rocks. Big rocks. This was a beautiful part of our ride. Occasionally the late afternoon sun would break through, but even in the dark clouds there was a sense of serenity in this lunar landscape. All this changed when we passed the point, Black Head, leading to Galway Bay. 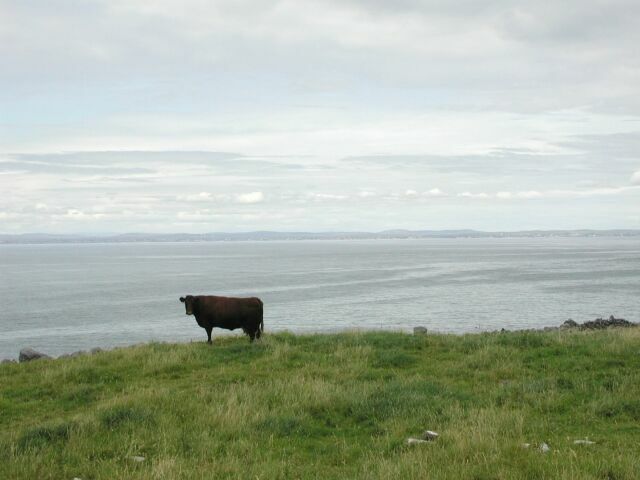 Gradually there were fewer big rocks, and we saw farm animals, such as this bull, and there were views across the Bay to our ultimate destination, Galway. There was one disquieting factor, however. Here there were many small bugs that would fly in our faces. Even without a bright sun, Len was glad to have his sunglasses for this part of the trip. Shortly after the turn into the bay, we encountered a strange sight. There was a horse-drawn wagon carrying an older man and two young girls. 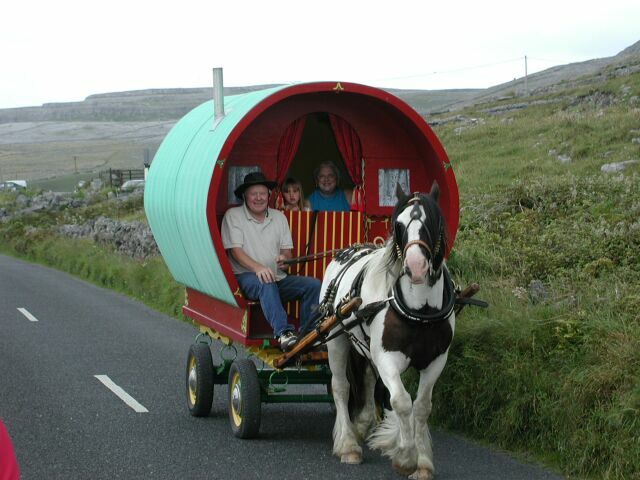 Len thought this was a gypsy, or tinker, as they are called here. I thought perhaps it was an amusement ride, since a little further on there was a commercial horse stable. However, I’d like to think that Len was right. It’s more fun to imagine that this is a home on wheels for an itinerant family. Our nightly stopping point was the little town of Ballyvaughan, which was about halfway into the bay, and practically the only town on the way to Galway. 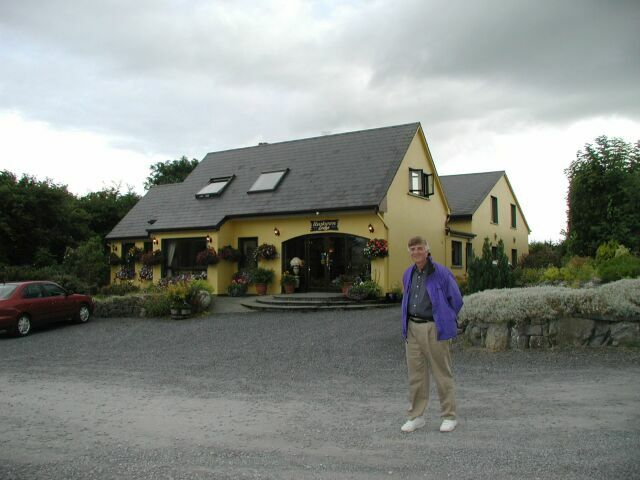 When we reached Ballyvaughan, Len immediately began asking people where the hotel was. I was saying that the whole town was only a block long, and it shouldn’t be a problem to find the place. But we were directed inland along another road out of town to the south. As the town disappeared behind us, I called out to Len that this couldn’t be right. We were headed out into the boondocks. So we turned back to the town, and were once again directed out of town. A mile down this road we found our hotel, the Rusheen Lodge, which was quite like a bed-and-breakfast. My room at the top of the steps was the nicest one I had on our trip. However, we had some concern about getting dinner. The town was a mile away, and we couldn’t bike since we would be returning after dark. We decided that we would walk, and our friendly hostess/owner gave us the number of a local cab that we might call to return if necessary. Before leaving we made friends with the owner’s little girl who was admiring our bikes out back. It was very much like staying in someone’s home. Somewhere along the way Len had managed to have his own encounter with stinging nettle. He asked the hostess where he might find some calamine lotion, and she suggested that the local gas station might have some. That seemed unlikely to me, but as we walked down the road towards town, we stopped at the gas station. They had a little convenience section, and surprisingly had calamine lotion. There was a young girl behind the counter, and when Len mentioned stinging nettle, she assured him that the calamine lotion wouldn’t do any good. “I’ll sell it to you anyway,” she added. Well, who could resist a sales pitch like that? Of course, Len bought the little bottle. The clerk told us that what we should do for stinging nettle was to take this large leaf that grew on some local plant, and rub it on the affected area. That would fix it, she said. As we left the station, Len and I laughed about that advice. We could just imagine finding some large leaf and rubbing the nettle, only to get some new terrible rash from the large leaf. We walked down the main street of Ballyvaughan, looking for a restaurant, and we immediately saw a place whose menu looked so good that we didn’t finish walking the street. Inside we were seated in the front section near the door, and the waitress took this happy picture of the two of us. Service was slow, but we had time to kill before the pub music began at 9:30pm. There wasn’t any point in walking back to our lodge. I had an excellent rack of lamb in mustard sauce, and soon it was time to visit the only pub with music, Greene’s Pub. Inside Greene’s the singer, a round-faced, middle-aged man, sat at a table in the middle of the small pub with his guitar. There was no microphone, and as he tuned up I thought that he wouldn’t be able to capture the crowd’s attention. Indeed, when he started with a traditional instrumental selection, he could hardly be heard over the conversation. Then, however, he began singing a ballad that was very cute. Gradually the noise subsided, and the patrons listened to the lyrics. Maybe they knew what was coming. 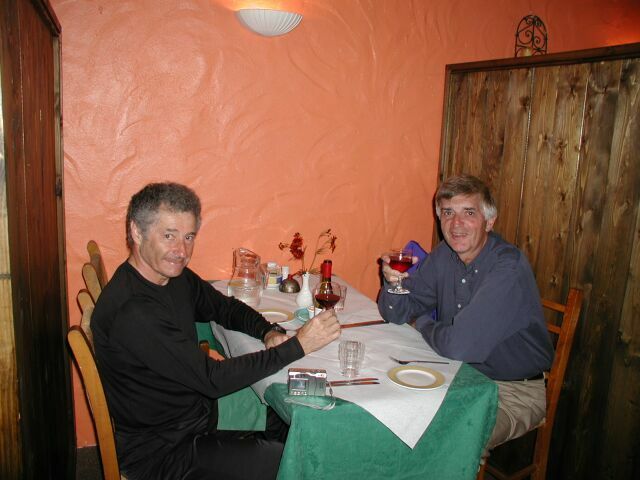 When the singer returned to instrumentals, Len and I left for the walk back to the lodge. Now, of course, it was dark, and on the little country road, it was very, very dark. There was no apparent moon. The road was narrow and flanked by high weeds. Every now and then we would see headlights sweeping towards us at high speed, and we would crush ourselves off the road, preferably on the opposite lane. Between cars, it was a spooky setting for us, since we’re used to ambient light even on the darkest nights. But here in rural Ireland, it was pitch dark and almost totally quiet. There was even an absence of the night sounds of insects. We walked past a country church, where a single light glowed from within. Altogether, it was a neat experience.